After searching high and low there appears to be no schematics for the 2701c online. So having located a paper copy I will add here the schematics plus the parts lists and any other extra info that is not already uploaded, including a dump of the firmware, as I get the spare time. To start with we have the Main PCB with the parts overlay and useful notes plus the relevant schematics. Additional is the option I-T2 120mA option schematic. One thing that I have not found answered yet is the firmware different for units with the current option installed or is it all the same and there is a jumper or link on the main PCB that tells the system it is present . 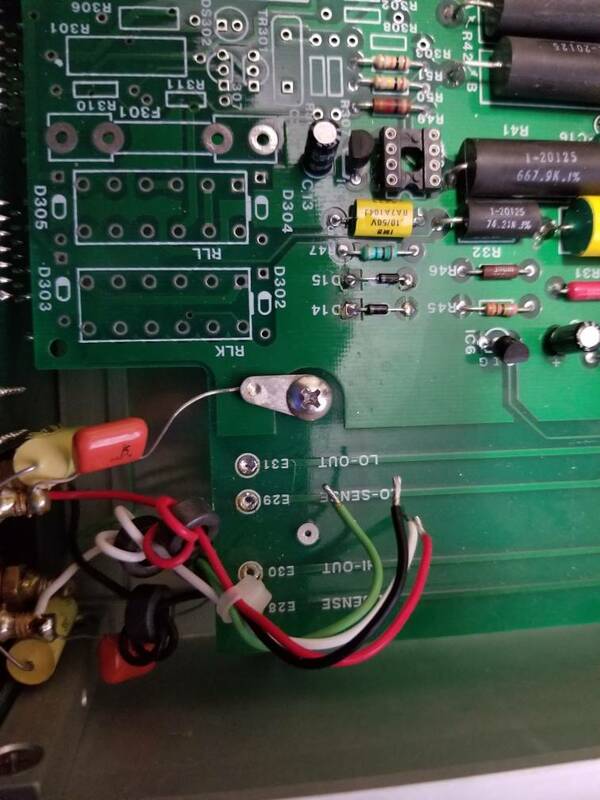 A possible hint might be from the GPIB option where on the schematic there is a pin on the header connection to the main PCB, (pin 20), called IEEE FIT tied to 0V which pulls down a pin on a 6821, (pin 16 portb), when plugged in. So perhaps the firmware just checks a logic level for the current option too !. Edit:1. added display and GPIB schematics + comp overlays. 2. 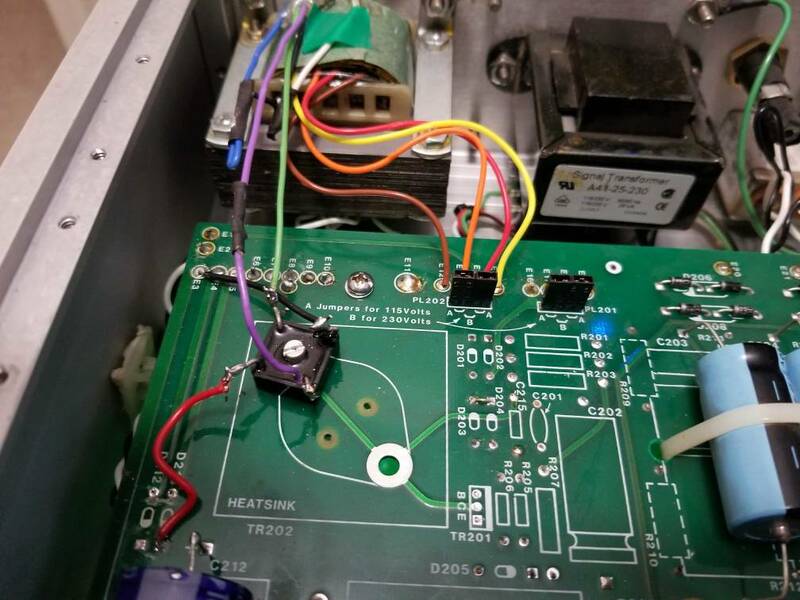 Had a good look on the main PCB and schematics and it looks like there is no test for the current option so its most likely a firmware difference, pity. Would be nice to try the firmware for the current option one day !. Re: Valhalla 2701c schematics +.. Mechanical drawings and Parts list. just in case anyone missed it, have a look at a very nice video from Shahriar Shahramian (aka Hugoneus) "The Signal Path"
lowimpedance, we missed your threads indeed. Lastly we have the ROM firmware from the 2701c with bonus pic of the label and the programmer read showing the correct checksum as per the label . Please note this binary file is for the 2701c with NO current option. Also the unit does not have the GPIB option either but I'll wager the firmware contains that function and does a check at power on. Displaying a "no IEEE" message during the startup test on the unit here. (must test that theory by shorting to 0V pin 20 on the header socket). I've got a 2701c en route that I found on fleabay. I'm hoping it is reasonably functional. Calibration keys are available from Valhalla... $50 per set plus shipping. I wish I'd thought of that. =) .. As an aside, I also asked them for a quote on refurbishment/repair if necessary; $2500 flat rate. While I don't expect to go down that route, it's good to know that they are still willing to rework very old gear. Given the price point of these new, that isn't horrible (but falls way outside of my comfort zone for hobby). Does the soon to arrive 2701c have the 'Current option' installed ?. If yes would you be able to read the firmware if you have access to a programmer, and only if your comfortable doing so of course. The required parts for the option are easy enough but unfortunately the firmware appears to be different so to retrofit one would need the firmware first. Any way if possible it would be much appreciated , but if not that's okay. BTW given the schematics it should be relatively straight forward to repair if needed. @lowimpedance - I don't believe it does.. but I'll check it when it arrives. I don't currently have a programmer, but I can acquire one if it indeed has that option. It looks like this doesn't have the 120mah option... but I need to crack it open. This is... very non-functional at the moment. It's producing 40volts out the rear in 20volt mode with the output on or off... and the front outputs are different yet again. *EDIT*: The traces for the banana plugs on the front were apparently desoldered at some point leaving only the rear banana jacks live. This unit has rack mounts on it, so it was likely a "safety" modification at some point in the past. I see a couple of date codes of 07 and 09, definitely doesn't have the 120mah option and the rom has a handwritten sticker that says "2701C-LNF" on it. I'm unsure if it's out of calibration because someone played with it, or if it is broken. The keys I ordered won't be here until Tuesday. In the interim, I'll start checking components on the board as best I can. If the current option is not installed there will be components missing at the front right hand side of the PCB. Post up a pic. of the inside of your unit to compare with others, to see if there are any significant revisions. As for the busted output , start your check at the Mosfet output string, (rear right hand side). one or more are likely S/C. Check TR11, 12 and D3 etc for starters. I'm about to check tr6-12 per the manual and then ic110/111, I think. Repairing the front is easy enough, they look to be clean pulls. Sadly no current option, but whats going on with 'that' transformer bodge . At least you have the GPIB option. Would be interesting to see what happens on the display at power up if you remove the header ribbon connector before hand. Should show no IEEE I suspect. 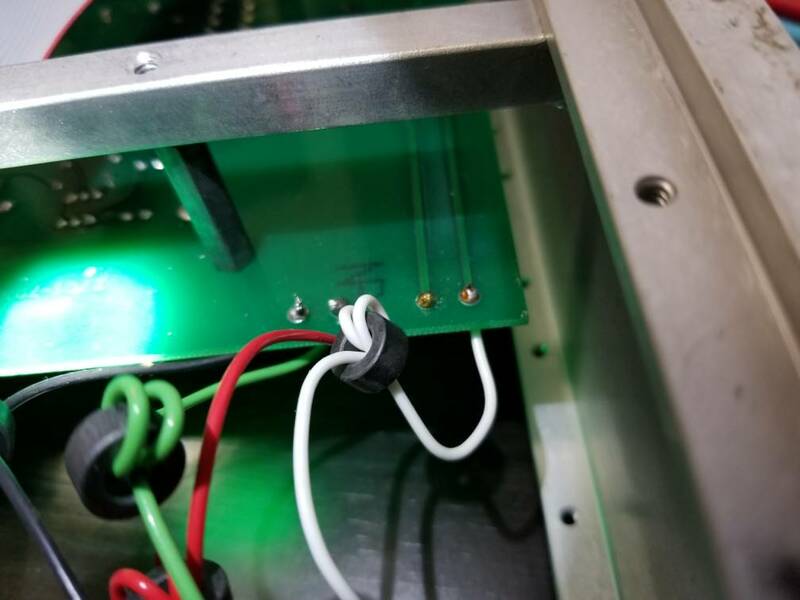 (proves that the comm's firmware is at least standard and just tests the installation of the connector to the interface PCB). Of course only do this test after repairs. PS I can post up any pictures of the inside of mine if you need any (if not already online). * External fuse is 1.5 amps installed, spec'd for 1.0 amp. * Internal fuse (F1/100m marking on the board) is too large physically for the clips, so someone just shoved a fuse between the clamp posts bending them outwards to "make it fit". 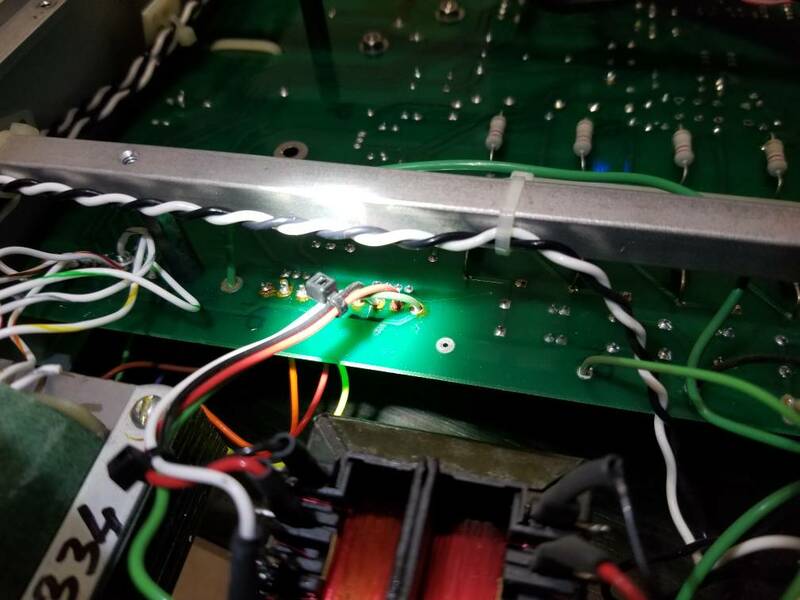 ** The wiring around the transformer is much 'worse' than I see in other 27xx pictures. Most others have all of the wiring topside and soldering bottom with neat tiewraps. This one has no tiewraps and many of the wires are soldered from the bottom of the board instead of the top. .... I don't know if this is a "Feature" of the LNF option (which drops the 1200v secondary transformer...) or what. 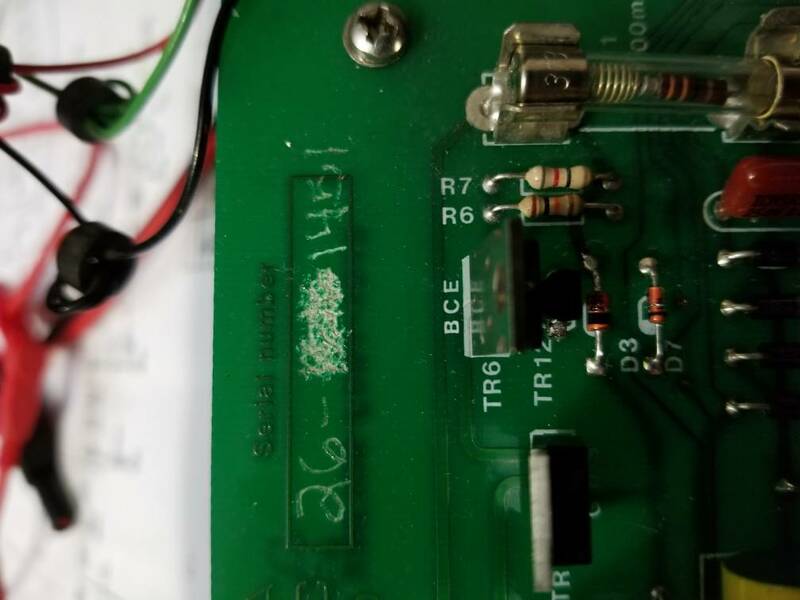 * random components on the board have flux around the solder joints, but most joints are pristine; makes me think someone has repaired this before. majority of the flux is around the diodes. I'm going to take my time with this and read/study... I'm honestly clueless with more gear than my skillset. So I'm going to try to grok what is going on around the board and see if I can identify anything that's been replaced vs. any documentation. Caps all look good... I'll open the bottom in a bit and see what's going on there. 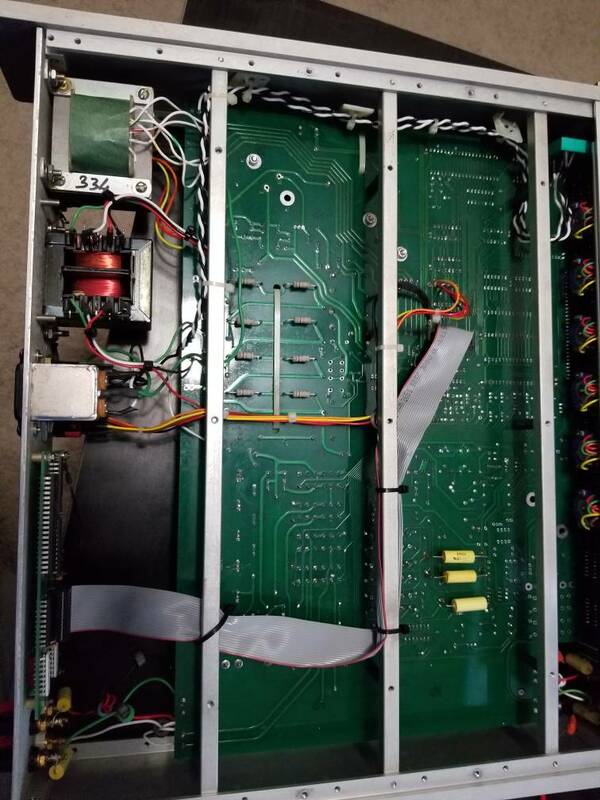 I think someone has pulled the mainboard out of this at some point completely and desoldered every wire that went to the board.... each wire joint has flux on it, is on the wrong side of the board, or is otherwise poor. This should be fun.... I probably need to move this over to "repair" to not anger the Metrology gods. The transformer input is interesting... what should be TR202 has the piece in the following picture in place... no markings on it other than the sinusoidal pattern on opposite corners and a +,- on the opposing corners. + goes to where D213 should be and feeds straight into the 16v 15000uF cap. Is yours LNF? If so, mind sharing pictures of the board? I'm thinking relay(s) at least... once powered on, output voltage is present. * All of the precision resistors are in spec according to my keithley 2015... well, R41 confuses me, but I think that's due to the 0.0uF cap piggy backing on it. 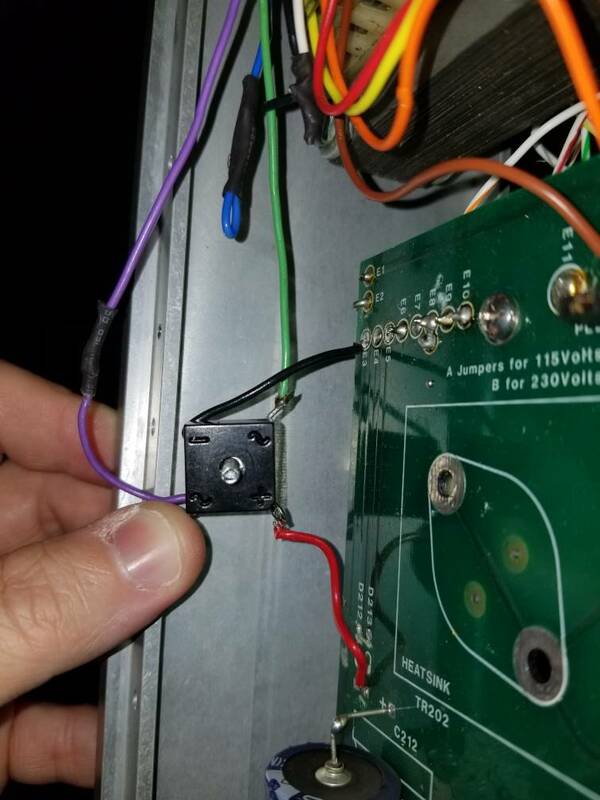 * Operate/Standby does not change the output voltage (haven't checked schematic to see if a relay is connected, but none switches regardless. * in 120V range, it produces 51V; interestingly enough, this is the only voltage range that I can impact with the front knobs. Turning the 10s place from 30 to 40 changes the output from 51 to 52 volts. In all other ranges, the front panel seems to have zero impact on the output voltage. Relays flip when switching ranges; 1200V range is ignored because this has the LNF option. Confirmed, it displays "no IEEE" with the board disconnected. At this point I'm stuck I think; in part in trying to decide if this board is in the middle of someone else's failed repair, or the way it's supposed to be, but ready for repair. Rail voltages off of the transformers are all correct, both AC and DC. mosfet chain appears good for the outputs. Q: Do ya'll hear a relay switch when you toggle between output and standby? *EDIT*: I've manually tested the 8 relays on the board and they do seem to properly latch in both directions... at least one of them is weaker than the others on one latch. There are components that used to be populated and have been cut off (pins still through the board, components just gone). I don't know if this is back to someone else's previous modifications, or part of the LNF (low noise floor) option. 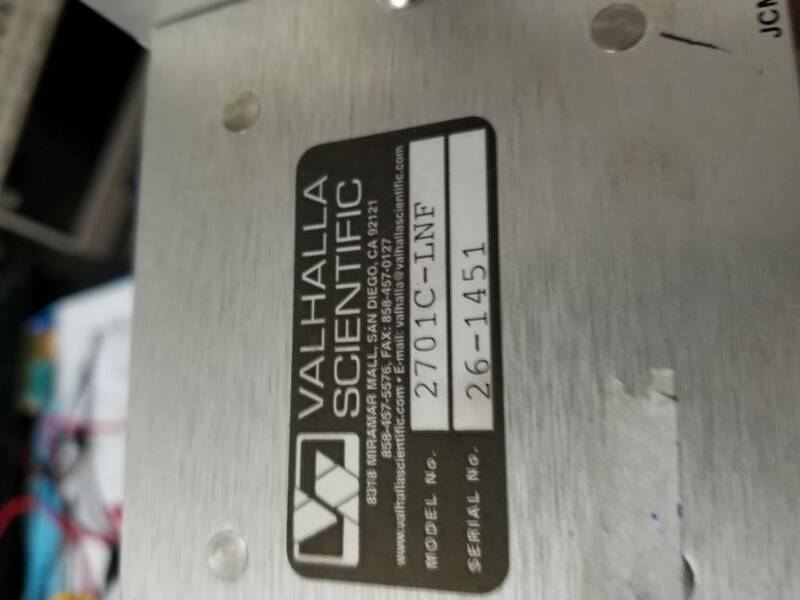 Valhalla Scientific tells me that the LNF option was "discontinued years ago", even though it shows up on the 2701C's webpage; perhaps there is another "LC" variant that provides that low noise floor in current models. This 2701C-LNF I have diverges from the schematics posted by a reasonable amount...including capacitors where resistors should be, and extra capacitors on the bottom of the board piggy backed on some of the high precision resistors. The high voltage caps, by comparison, have dotted line silkscreening on the front of the board to identify where the resistors on the bottom of the board would go. So.. at my skill level I' having a hard time telling if someone tried to repair this, tried to modify it's functionality, or if this is a variation due to the Low Noise Floor option coupled with various repairs (there are very obvious signs of repairs that I would consider poor; flux that wasn't cleaned up, pieces of paper towel caught on the pins on the bottom of the board as if someone tried to wipe the board off, etc). I've been scouring the internet for information on the LNF option, hopefully with associated pictures, but haven't had any luck yet. Calibration keys arrive tomorrow, and while I don't think all of the wonkiness on this can be explained by calibration alone, I'm going to give that a shot as the next step. I've got a Hakko 808 on order so make it easier to pull and test these some of these thruhole components, and I've ordered a spare set of NoS ICs for everything except the microprocessor from fleabay... The next bit to order are some of the relays; I've got a couple that are questionable on their latching, and a couple of the latches seem to allow a small bit of conductance on what should be open circuits. *EDIT*: IC9 is unpopulated from sheet one, lower right. IC10 is populated. IC9 is a JFET just like IC8 and IC11; IC9->IC10 feeds into line 15 on IC108 which controls the relays. I'm unsure of the control flow here, but I can't grok why IC would be unpopulated. Currently trying to scavenge a LF356N (unlikely) before ordering a few. Either the -LNF option is primarily "remove a lot of parts" or someone decided to use this one as a donor unit or some-such. Meh. 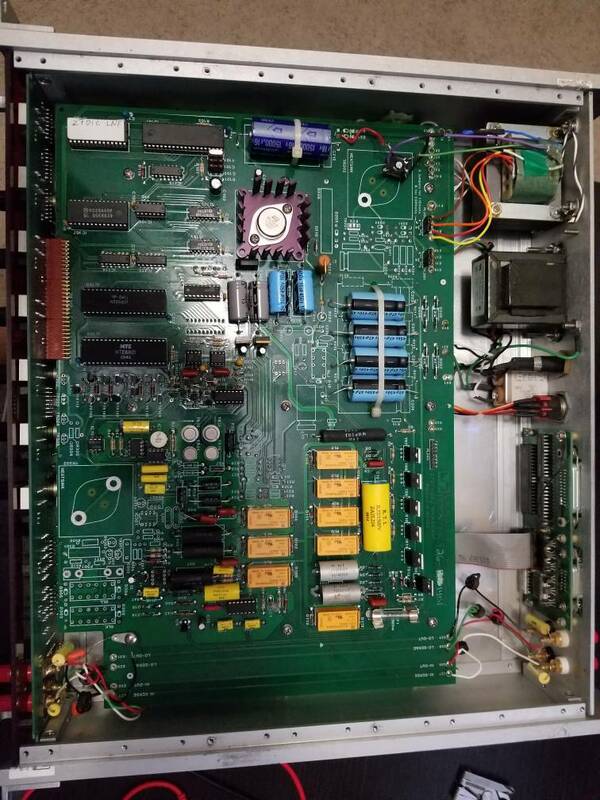 It looks very much like some one has done a butcher job in converting it to a "LNF" version by replacing both transformers and hacking out all the components related to the high voltage sections. None of this looks like Valhalla mods, so who ever hacked into it presumably had access to the circuit details of the LNF version and Firmware too). One check to see if the ROM has the correct firmware is at start up the display will show 2701C40 which is the LNF identifier. Sorry I dont have any documentation on the LNF version, perhaps you could get that direct from Valhalla which may help you do a better job on this unit. I recall reading that the LNF version is limited to only +/- 40V out and uses toroid transformers !. (clearly not the bodged in ones in your unit). Also having a GPIB doubles the wideband noise spec. again. Given the correct details it should be possible to revise this unit properly. Or if your after more than 40V I would suggest moving it along as it may be too costly to repair it to its original high voltage version. Considering the transformers will be Valhalla custom made ones and you will need those to start. The other componenets should be readily available and the firmware is attached here. I'll spend a couple more days on it since I've spent a little on new ICs and calibration keys and then decide about using the 14 day return with this seller or selling it. Darn. .... the serial number on the board makes me wonder if someone made a mistake at the factory, or what... it matches the exterior serial, however. I'd love to know the history of this unit. It would be nice to get the background to what happened to this unit, could be exactly as you suggested. Certainly had nothing to do with Valhalla. Perhaps try to find another unit and keep this one for an interesting project ... good luck. Cal keys just arrived... and no go. Too far out of spec for calibration to work as I guessed. I've asked Valhalla for schematics on the LNF, will see if that yields fruit. Otherwise, I'm continuing to literally follow traces testing component by component while I wait on spares. Another example is that IC110 and IC111 (if memory serves) calls for dual optocoupler 8 pin dips... mine has a single in one of the two (110 I believe).. which while that doesn't match the parts list, it DOES match the actual functionality. The electrical path through that particular socket only uses one optocoupler.